Since qualifying in 2003, Vikram has strived hard to achieve the highest standards of patient care. He has worked in various hospitals throughout the UK, gaining invaluable oral surgery and sedation experience. 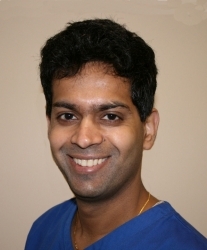 Dr Kavi has undergone implant training with the FGDP and now brings this experience to North East Scotland. Patients just beginning to think about dental implant treatment may find it helpful to attend a preliminary consultation with Mr Kavi. This appointment does not include a clinical examination and it only takes 15 minutes. The discussion will help when considering the options for treatment and whether to proceed to a clinical consultation for implants. The preliminary consultation is free of charge for visitors enquiring through this website. The next step is a clinical consultation. This includes a comprehensive oral examination, and results in the production of a fully-costed individual treatment plan. CT scans are charged at £125 for one jaw and £200 for both jaws. "I am delighted with the results, my chewing has improved greatly, they look natural, a perfect fit and I have more definition in my jawline. Any concerns that I had during the procedure, I could address with Vikram, thus ensuring that I was totally at ease at all times. The whole team contributed to my comfort throughout as they always were polite, professional and welcoming." "I chose to have a dental implant to replace a damaged tooth. I must record my absolute delight with the outcome which even close relatives and friends cannot distinguish from the original. I cannot commend Mr Kavi and his colleagues highly enough. Whilst those around him helped to project an atmosphere of friendly efficiency, he himself has a warm and welcoming personality which, combined with his highly professional skills, filled me with absolute confidence during what was, inevitably, a complicated procedure. From my experience I would recommend that anyone with dental problems, particularly those who are embarrassed or apprehensive, should go along to the Crown Dental Group for skilled, safe and friendly advice and treatment." Treatment can be carried out with oral, IV or inhalation sedation. Maintaining absolute confidentiality, the aim is only to treat what the patient has been referred for. Involvement from the referring practitioner for the restorative or surgical sides of treatment is welcomed. Cases for practitioners that place and restore their own implants can also be planned. 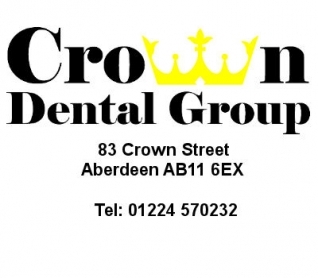 Crown Dental Group is an advanced, state of the art practice in the heart of Aberdeen, providing independent quality dentistry. Utilising the latest techniques including CT scanner, the practice ethos is to provide a relaxing and enjoyable experience. The practice acts as a referral centre for implant and sedation.